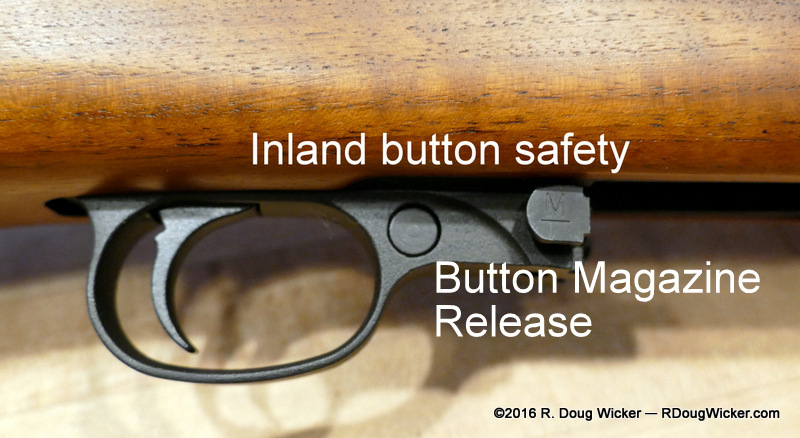 The new Inland M1 Carbine (discussed on Wednesday’s blog article) is a true copy of the original M1 Carbines manufactured during World War II. Indeed, all parts going into Inland Manufacturing’s new iteration are compatible with U.S.G.I. (U.S. Government Issue) examples made by Winchester, the original Inland division of General Motors, Rock-Ola, IBM, and others. After the war many returning servicemen longed for M1 Carbines for their own, as the rifle was lightweight, suitable for hunting medium-sized game, and easy to shoot with remarkably light recoil. And so it was that surplus M1 Carbines were released by the government onto the civilian market, but demand eventually outstripped supply. At this point various civilian manufacturers stepped forward to fill the void, most often using leftover parts to assemble new M1 Carbines, or to refurbish older ones. These companies included Bullseye Gun Works; ERMA; Global Arms; H&S; HOWA (Japan); Johnston-Tucker Arms; Millville Ordnance; National Ordnance, Plainfield Machine; Rowen, Becker Company; Steelville Manufacturing, Tiroler Sportwaffenfabrik und Apparatenbau (Austria), Tri-State Tool & Die; William’s Gun Sight Company; and, of course, Universal Firearms. Universal began producing their Universal M1 Carbine using surplus parts, but as supplies dried up they began manufacturing in-house. 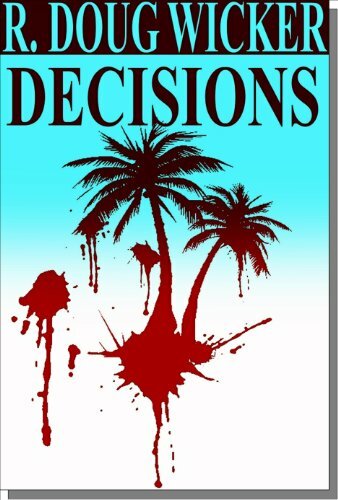 Unfortunately, in-house means increased cost. 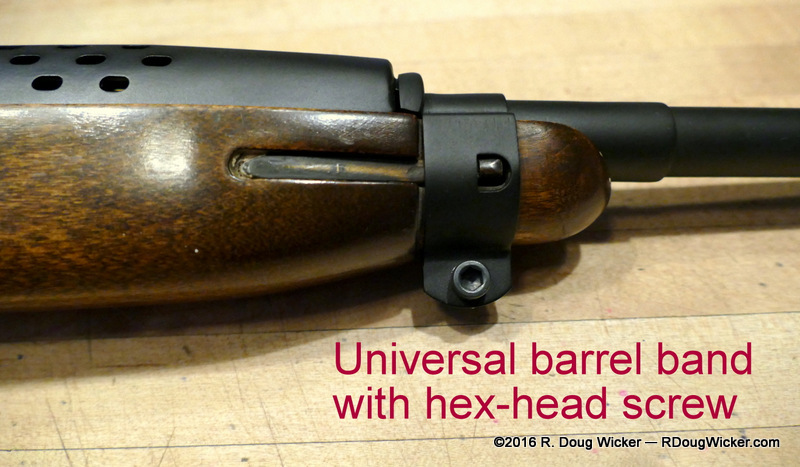 Universal thus redesigned the basic M1 Carbine to cut manufacturing cost, resulting in a reduction in quality, reliability, and according to some, safety. An abject lesson for the uneducated gun collector: Stick with what you know, and research what you don’t. I’ve always wanted an M1 Carbine, so when I found the Universal 3rd Generation pictured here at what I thought was a good price, I snatched it up. Yes, it was a good price . . . for a U.S.G.I. original. For a Universal it was not. After I took it home and began researching M1 Carbines, I found that the 3rd generation Universals bore little in common with the original design, and even far less in quality and reliability. 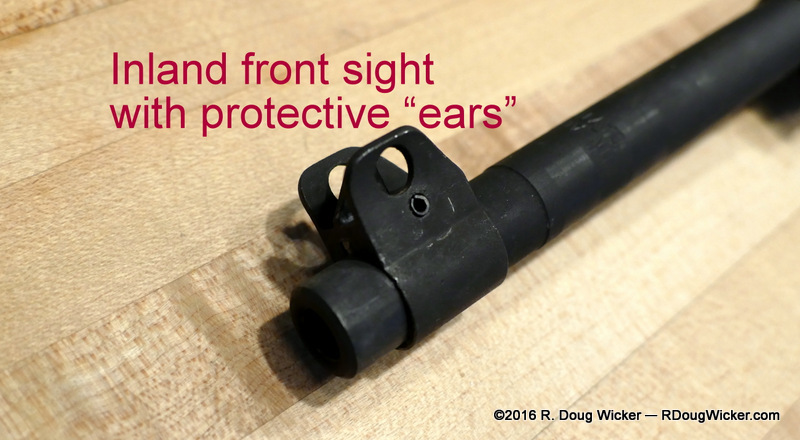 There are of course the little things, such as the use of a metal handguard rather than the more expensive wood piece of the original. Then there’s the front sight, which lacks the protective “ears” characteristic of military weaponry of the era. This is not to say that the M1 Carbine design was perfect straight out of the starting gate. There was room for improvement. For instance, the original design had a push-button safety. Soldiers in the field hated it, because in the heat of battle it was too easily mistaken for the nearby magazine release. In a firefight it’s just considered bad form to drop you fully loaded magazine onto French soil when you’re supposed to be firing your weapon. Pretty embarrassing, actually. 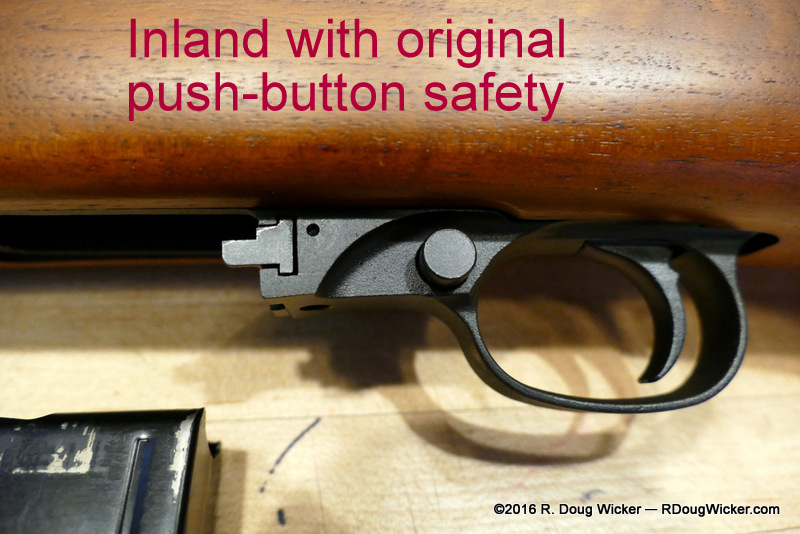 Later M1 Carbines substituted this push-button with a flip-lever, and this is the design incorporated on the Universal. Other changes really don’t make any sense, at least to this manufacturing novice, and one would think some changes would actually increase manufacturing costs. 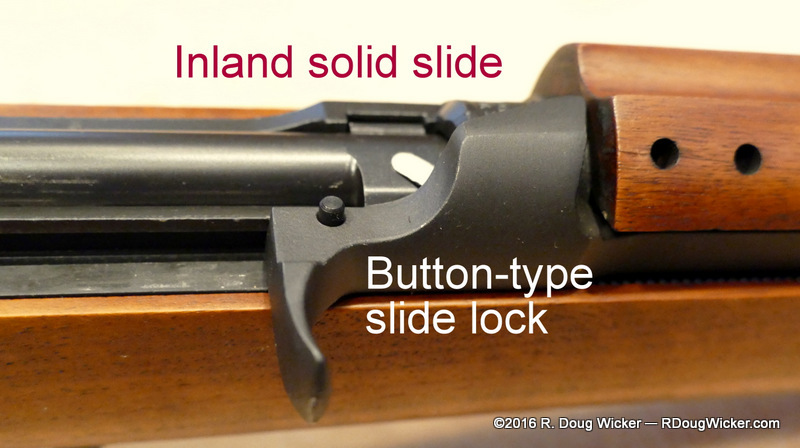 One example is the slide lock. On the U.S.G.I. 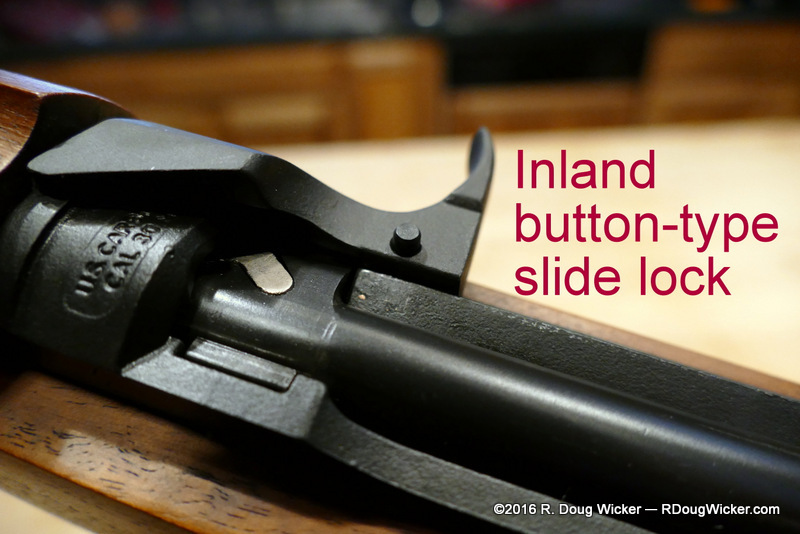 this is a simple push-button mounted atop the slide. 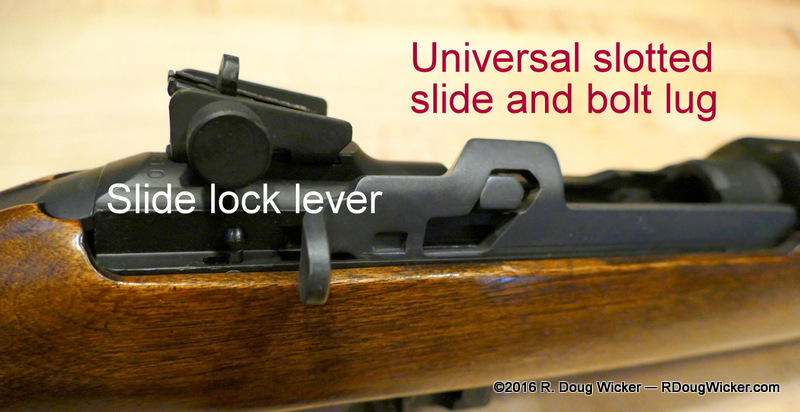 Universal decided to replace this simple, effective, and cheap system of locking back the slide with a lever mounted behind the slide directly onto the receiver. Some parts appear relatively unchanged. The U.S.G.I. 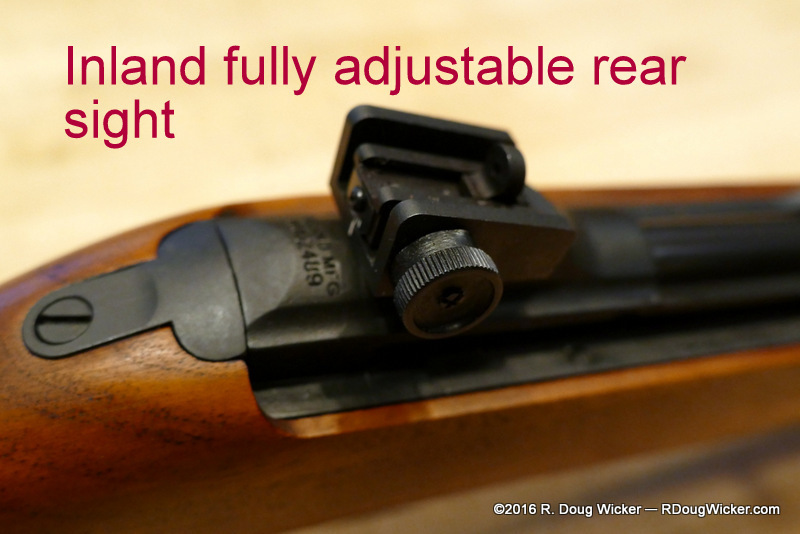 had a rear sight that was fully adjustable for both elevation and windage. 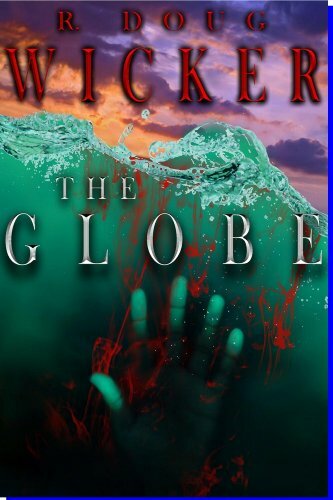 This is one feature retained on the later versions of the Universals. 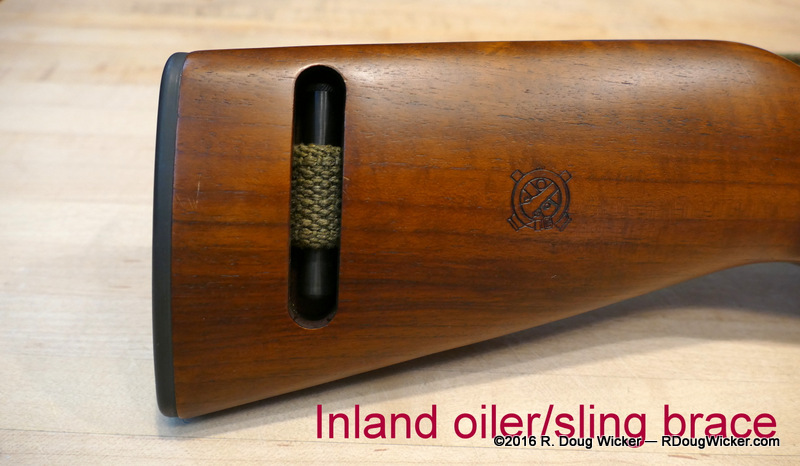 The new Inland Manufacturing, however, pride themselves on not only retaining the matte finish, but even matching the wood grain and the stain of the original to duplicate as close as possible the look of the guns that came out of the old Inland division. Even the U.S. Armory Ordnance cartouche is replicated on the stock. Inland stock duplicating the original Inland’s grain patterns and stain. One last difference that I find particularly unnecessary and even galling, and I don’t even know if this was original to the Universal or if this change was made by a previous owner. 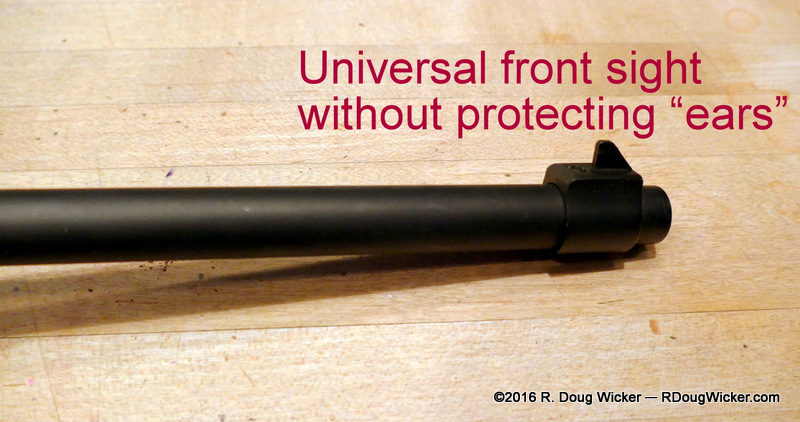 That would be the screw used to tighten the barrel band around the handguard and the forestock. On this copy the screw is a hex-head, which is something one would never find on a combat weapon as it makes disassembly and cleaning dependent upon a tool that would normally not be available to the soldier, or otherwise easily lost. The U.S.G.I. 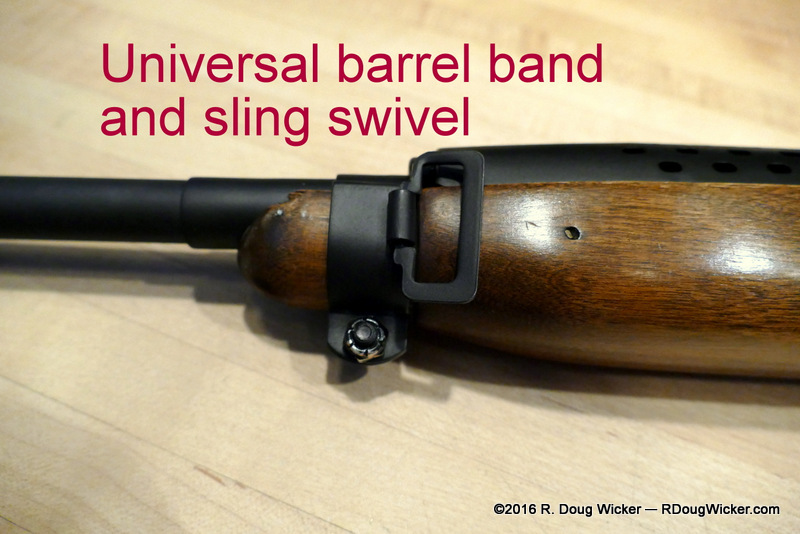 barrel band was tightened into place with a flat-head, which could easily be turned using anything from a coin to the lip of a spent cartridge. 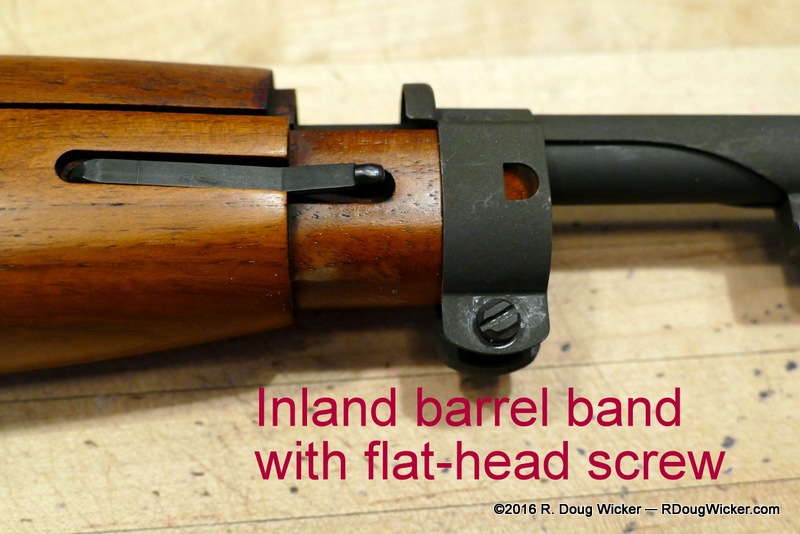 Below is an image of this barrel band screw on a barrel band that has been loosened and moved forward in preparing to remove the handguard. 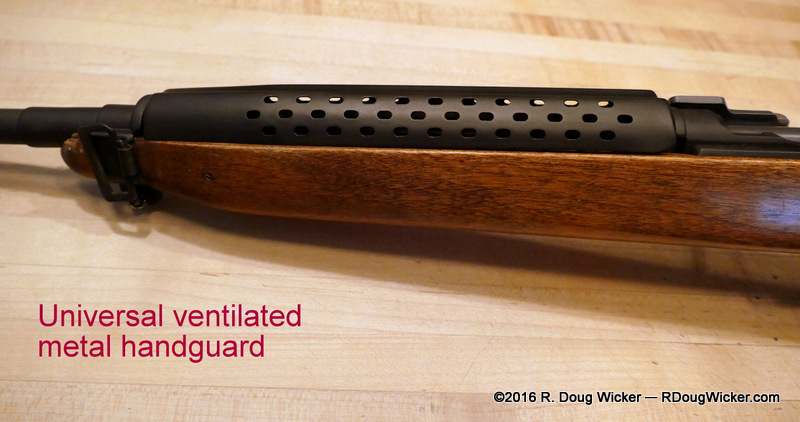 To my gun followers, I hope you’ve enjoyed this week’s look at two very different versions of the .30 M1 Carbine. As for my travel friends, starting next week I’ll be presenting a closer-to-home road trip into an area of New Mexico I’ve not yet presented — the area around Silver City, into the Gila National Forest, and along the famous Cat Walk. Also in that upcoming series we’re going to review a charming hole-in-the-wall gourmet restaurant with a twist — not only must you make reservations in advance, you just also go online at least a day in advance to peruse the chef’s ever-changing daily menu and place your order at that time.